In the young individual the transition between lower eyelid and cheek is imperceptible. The dividing line between these areas in older individuals is the nasojugal crease also called the nasojugal groove (term first used in 1961) or tear trough (term first used in 1969). It is an early sign of aging around the eyes, lending a fatigued and aged appearance to the face. As part of the aging process ligaments that fix facial skin to the underlying facial bones thin and lengthen or stretch, facial bones recede back and facial fat shrinks. 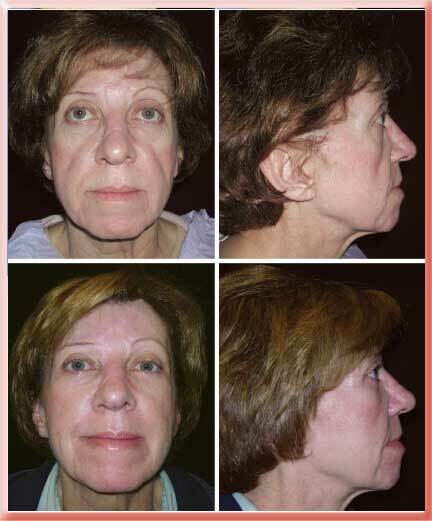 This results in the drooping of facial skin and appearance of laugh lines, jowls, nasojugal creases, eyelid bags etc.. The skin within the nasojugal groove or crease becomes thinner and/or darker in color than the slightly lower nose or cheek skin. It can also seem deeper or be more visible if there is protrusion of fat into the lower eyelid. The aging process starts near the nose as the tear trough and progresses outwardly towards the same side ear becoming what is called the palpebromalar groove. 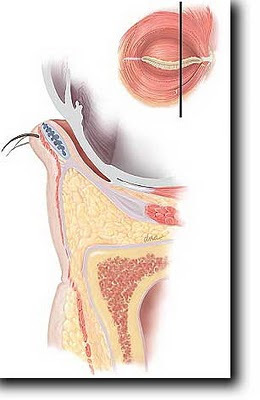 In the aging eye a loose orbital septum membrane and/or receding bone under the eye allow eyelid fat to bulge outward making the tear trough more noticeable. 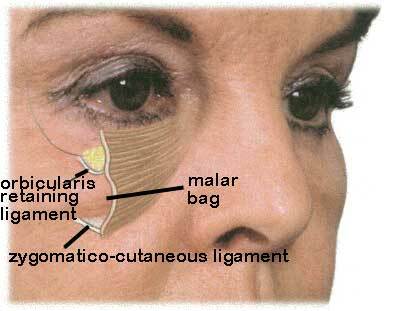 Plastic surgeons treat the nasojugal crease or tear trough in a number of ways. Drooping tissue can be lifted up with the aid of sutures, material (fat or synthetic fillers) can be injected or placed right into the crease line to efface it or implants can be placed to replace the absorbed receded bone. It is difficult to treat the area because the soft tissue between the edge of bone and outer skin surface is so thin and the skin is very thin as well. Because most of this soft tissue is in fact muscle with little fat or skin there is a tendency for anything injected into this area (restylane, fat, sculptra etc.) to form visible lumps and/or be visible through the thin skin. Muscle movement also tends to make the injected material coalesce into lumps. The width of area you can safely inject into is very thin and if you inject right on the bone or just under the skin you will have a problem with most fillers. Some surgeons therefore advocate placing an implant made of silicone, medpor or goretex right on the edge of bone under the eye with the thought of augmenting to replace lost receded bone. For over 50 years plastic surgeons removed the eyelid fat through a skin incision (as in this Afro-American patient) or an incision on the inner surface of the eyelid when performing lower eyelid blepharoplasty. This approach hollowed out the eyes and accentuated the appearance of the tear trough. Although it got rid of the protruding eyelid fat it did not restore the youthful invisible transition between lower eyelid and cheek. The facial skin is different than other areas of the body in that there are ligaments directly connecting the deep surface of the skin to the bone. In the palpebromalar groove the ligament is called the orbicularis retaining ligament. Lower down on the cheek is another ligament called the zygomatico-cutaneous ligament. The reason for all this is that different parts of the face move separately and with variable ranges of motion. Without these separating ligaments facial expression could not be so diverse. The zygomatico-cutaneous ligament can be tighter or shorter relative to the other ligaments causing a line along its length or malar bags to appear. Injection works best for patients with thick, smooth skin, and a well-defined tear trough, without excessively protruding lower eyelid fat. Patients with extremely wrinkled skin and less of an actual indentation to fill do less well with injections. The larger the overhanging eyelid fat, the less improvement you will get from filler injection alone. The older and more crepe-like the skin, the less well the injection works. In the tear trough, hyaluronic acid like restylane or juvederm lasts far longer than it does in the lips and nasolabial folds. One to 1½ years is not uncommon. Only small amounts 0.2 to 0.4cc are injected at a time and into or beneath the muscle. Then massage is used to even it out and prevent lumps but over massage can displace the filler. Some doctors prefer using a blunt tipped needle to avoid piercing any blood vessels under the skin. If you need skin removed as well its better to have it removed and then recover before doing the injection. Filler injection is not a substitute for surgery in those who would benefit from surgery i.e. have protruding eyelid fat or excess lower eyelid skin. Belotero is another hyaluronic acid that was approved in November 2011. When it is processed the hyaluronate chains are crosslinked in a non-uniform fashion so that the amount of crosslinking varies through the different parts of the injected gel. 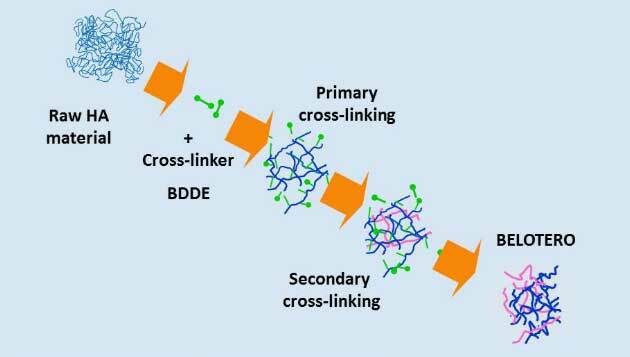 In this diagram the crosslinking is represented by pink lines that are non-uniformly distributed within the mass of hyaluronate. This allows the material to get into the nooks and crannies of the skin when injected superficially. It is then less likely to form clumps, attract water molecules or reflect blue at that level (Tyndall effect) than restylene or juvederm, which makes it a better choice for tear trough filling. It can be injected between the eyelid orbicularis muscle and the overlying skin which is a much more superficial level than can be tolerated by other fillers. However, if more than a few tenths of a cc of the material is injected it can cause the same problems of Tyndall effect and visible swelling. 63 year old with injection of 0.2 to 0.3cc of Belotero to each tear trough and palpebromalar groove. The after photo was taken only 1 week after the injection. The only problem with this approach is that it is not permanent or even semi-permanent. This seems excessive given the results that are currently achievable by injection as depicted above. I prefer to use implants only if the vector of a perpendicular from the cornea drops down in front of the cheek tissue, a negative vector. 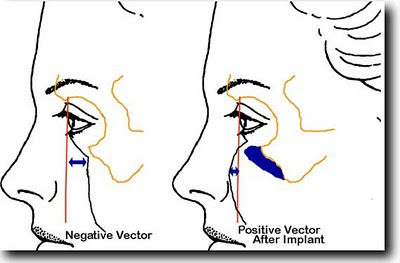 In such cases the use of an implant can convert the patient to a positive vector and significantly add to the end result. The presence of a negative vector in and of itself also makes the tear trough more visible over time. 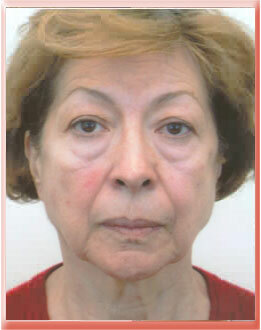 This is a patient of Michael J. Yaremchuk, M.D., FACS. This patient had a negative vector that was improved with the use of an implant. This is my preferred approach because it gives virtually permanent results with less risk and a natural look but it cannot be performed on every patient. In this patient I removed excess eyelid skin via an incision just under the eyelashes, cut the orbital septum membrane and sutured the eyelid fat to the deep cheek fat. Only a small amount of eyelid fat was trimmed away or removed. This younger patient had no excess eyelid skin so I only cut the orbital septum membrane and then sutured the eyelid fat to the deep cheek fat. I did not remove any fat from the eyelid. 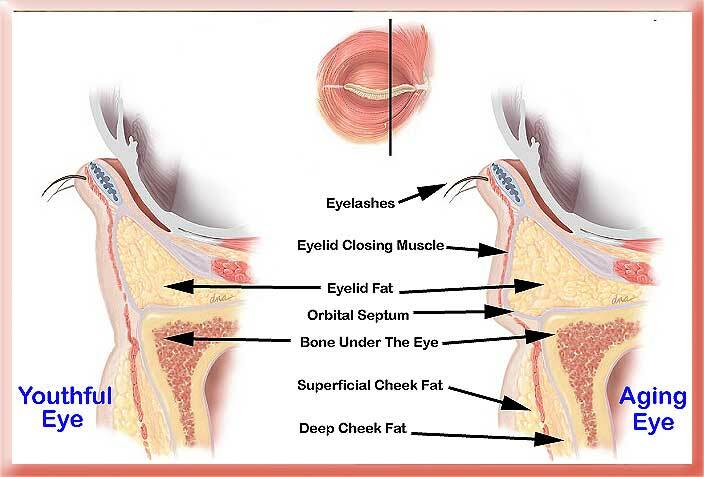 In older patients with hollowed out eyes that are undergoing a facelift I prefer to take some superficial cheek fat (SMAS) and place that is a graft over the edge of the bone. That gives much the same result as the filler injection shown above with almost no risk of lumps or unevenness and the added advantage of being permanent. The most difficult patients to treat are those with protruding eyelid fat that moves in and out of the eyeball socket as the eye is moved around. 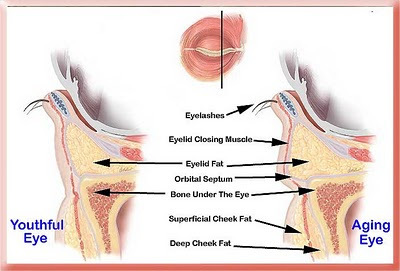 If you just suture the eyelid fat to the deep cheek fat the continual backward forward movement of the fat will separate it from the cheek fat and over time lead to a recurrence of the problem. Hey! I am 29yrs old and have under eye bags. I have tried many creams, but nothing worked out. I used to have beautiful eyes, want to get them back. Please suggest the best option for me. Either a filler or surgery would be appropriate. Without a photo or face to face examination it is impossible for me to make any specific recommendation. As far as I am aware there are no topical creams that are effective for lower eyelid bags. Thanks for d reply 🙂 I will mail u my pic, if u provide me ur email id….thanks!!! You can click on the "Click to Email Dr. Stone" button in the right hand column of this blog to email me directly and attach a digital photo to the email. Hi Dr. Stone. Thanks for the really informative article. I have a question. I've been reading about hylaronic fillers used to treat the tear trough and there seems to be a 50/50 split on the use of Restylane vs. Juvaderm. What is your professional opinion on this? Do doctors tend to go with Juvaderm because it's simpler to inject and work with? Does one, in your opinion, tend to give more natural-looking results? Thanks! Different doctors will have different opinions based on their experience and patient populations. The science though supports the use of more hydrated forms of hyaluronate in the tear trough. The less hydrated forms will absorb water from the tissue after injection and swell. This can be a problem in the tear trough area because the tissues are so thin. In order of decreasing hydration the hyaluronates would be Prevelle Silk, Restylane, Juvaderm so Prevelle Silk would be your first choice. Your doctor may choose a specific filler for a number of reasons – he/she gets a discount on buying a particular filler, he/she has more experience with a particular filer, that is the only filler he/she has in stock in the office etc. My issue isn't so much the tear troughs, but rather the palpebromalar groove which has gotten more prominent as I age (I'm 45). Is this area "off-limits" for fillers, or can it be treated too? I would like to fill it a tad, if possible. I assume you do not have excess eyelid skin or protruding eyelid fat, in which case an injected filler, if placed with proper technique, should give you what you are looking for. The area is not off limits. Fat injections have a greater tendency to form lumps in this area. My personal preference is the surgical placement of a thin piece of fat as a graft, because of the high take rate, low incidence of lumps and lasting results but that approach is not accepted by every patient. In such cases dermal fillers are the only other options. Many thanks for your reply, Dr. Stone. Your blog is very informative. 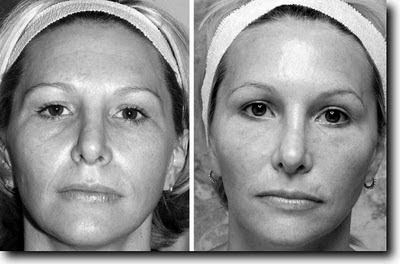 Do you normally use regular ("medium") Resty and Juvederm in this thin-skinned under-eye area, or do you recommend the "Fine" versions of fillers there? Now I finally have a good answer. Belotero is the best HA for the tear trough and palpebromalar groove because the random cross linking allows it to blend in with surrounding tissue so it can be injected very superficially. I’m 27 and only have a tear trough under my left eye. 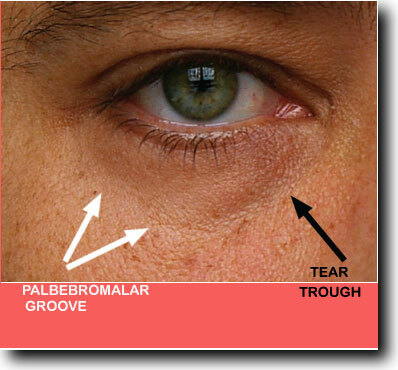 My skin is thick and smooth directly under the tear trough line like the above e.g. of the 37 year old – who had been injected by a hyaluronate filler. I have Asian skin and the area under my eye is darker in tone. I’m thinking of getting this procedure done soon but worried about the side effects. I’ve heard about people who have been injected in the wrong area and as a consequence suffered from permanent bruising. I’m getting married in June next year and can’t afford for this to happen. Is this common? One consultant told me that after the first injections, I’d have to return in four months for a follow up and get re injected, is this common or just a money making ploy? Do you think someone will agree to treat just my left tear trough? I doubt I’ll need much filler – do you think I’ll be able to negotiate a rate? I once went for a consultation and the surgeon recommended I go for sculptra, what are your thoughts on sculptra? I do not think permanent bruising is common in these cases. Hyaluronate fillers placed in other areas go away more quickly, usually in a 3 to 4 month time frame. In this area they tend to last longer. I am not sure why you would have to came back at 4 months. I would say in the absence of a problem such as a chronic infection you should not have to return to the injecting doctor for closer to a year. If the trough on only one side is affected there is no reason why you could not inject only the one side. I personally prefer sculptra only for deeper injections like deep in the cheeks. Injecting it into areas that are more superficial is fraught with multiple problems. The other good thing about hyaluronates is you can easily remove excess material by injecting hyaluronidase. Great article! I'm only twenty years old, but already I've got quite a deep tear through. The shape of my eye and tear through looks a lot like that first picture in your article, only deeper and more sunken. However, due to very thin skin, the area is completely pink/dark blue. The guy in your picture would probably say that he had dark circles, but my lower eyelids really are purple. I've never seen anyone with this kind of see through effect under the eyes. The tear through makes it look worse, but I wouldn't care about that had it not been for the discoloring. Is there any way of fixing this problem? 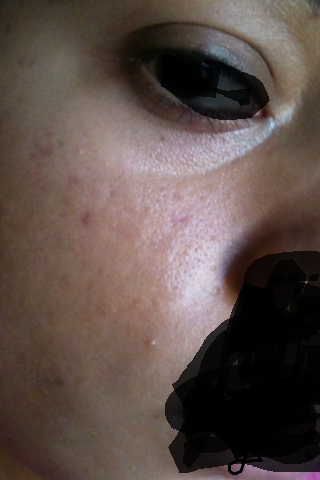 I have no allergies and I know that the discoloring is due to thin skin (and not too much pigment etc.) because I can see a vein under each eye without stretching the skin. Could one perhaps fill a layer of fat under the skin of that whole area, and not just under the tear through? Or is an implant maybe a better option? Also, do you know what one would call this deformity? Thank you so much in advance for answering. Without ever having seen you it is impossible to say exactly what you have or what is the best way to address it. Part of what you are describing may be due to a shadow. In any event an injectable filler is likely your best bet and this may change the quality of your eyelid skin so less of the muscle under the skin is visible. From these photos it looks like your best bet is an injectable filler. I am a 27 year old woman and I have a problem with this on one side of my face, similar to that of the first picture. I think it may have been cause they a trauma to that area (cheekbone endured a severe blow two years ago) and since I have noticed that that side of the face is different. Without make up it looks like I have a black eye. I am wondering what I should do to treat this? Also generally how much filler is needed if that's the case and if it is expensive. Never having seen you or a photo of you I cannot say what your best options for treatment are. It is possible that the traumatic blow killed some of the soft tissue or even fractured the bone resulting in the appearance you describe. If filler is an option in your case the amount of filler required will vary according to the severity of the defect and your body's response to the filler. Sorry but I cannot give you more specific or definitive answers based solely on the limited information in your comment. Hi Dr. Stone, I have under-developed cheekbones which has resulted sagging cheeks. It was never much of an issue until I hit 40, but now I'm starting to look jowly. 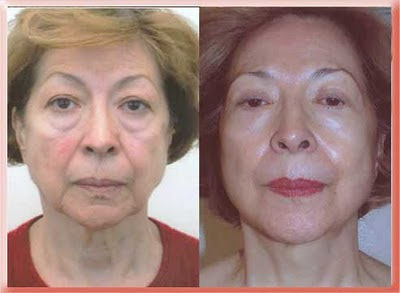 Do you think facial exercises work? I'm skeptical. Also, what about fillers? I can't afford cheekbone implants, so I'm wondering if fillers would be enough to "create" cheekbones and lift my sagging skin. The logic behind facial muscle exercises does not make sense. How can activation of the muscles, that cause aging changes of the face by their actions, reverse the aging changes of the face? Facial implants can be partially replaced by injectable fillers or fat grafting but if you need significant forward projection the fillers are not reliable. Some years ago I came across a medical journal article espousing the use of injectable hydroxyapetite for cheek augmentation. If placed right on top of bone this material can become permanent bone and this was mentioned as a major factor for using it. The problem was that in the days to weeks it took to fully harden. The original molded shape was usually lost during that time. Implants are still the most reliable way to augment the cheeks. Thank you for your answer. Just one more question if you don't mind. I've heard cheek implants can move around slightly, and end up making the face look asymetrical…have you seen this happen? And can the procedure be done under local anaesthesia? I guess that ended up being two questions…sorry. Any facial implant that is not fixed to the bone or incorporated into the soft tissue can migrate or shift out of position. The procedure can be done under local anesthesia but that does not mean is should be done under local anesthesia. i dont have bags it is sunken in .. i want a treatment but i've heard cases of blindness .. what do you suggest doctor ? Belotero is a nice quick relatively cheap fix though it is not permanent. A sheet graft of fat placed surgically right on top of the bone rim is a more expensive and more permanent solution. This different from injecting fat grafts. Neither should cause blindness if performed properly. Ok I am 31 and just figured out from the info here and elsewhere I have festoons not eye bags as I had assumed they were. Noticeable tear troughs, some hollowness but not complete quite yet under my eyes. I also went by the diagram here and it seems I have a negative vector from my cornea. With the myriad of things I would like to alter to get my preffered aesthetic, yes I know it's only through my description, what order should I begin looking into the procedures so I don't start the wrong way and have to immediately redo one of them? I cannot make any specific recommendations because I have never seen you. I don't understand why you would want to do multiple procedures in some specific order. Whatever modalities are employed the surgeon should take all of the pre-existing factors into account and plan accordingly. That is why you need a physical examination before surgery. With respect to the corneal malar vector, I cannot see how anyone could reliably measure their own vector. Even if you use a couple of mirrors it would be difficult. I did not mention them because external laser on the skin does not get rid of lower eyelid bags which are psuedoherniated lower eyelid fat pads. Ablative skin lasers on top of previous blepharoplasty skin removed eyelids is usually not a good idea. I once had a patient whose eyelid started to pull away from the eyeball before I even crossed from the cheek to the eyelid. Luckily that was temporary because I stayed away from the eyelid itself. I think you posted this in the wrong blog post. Regardless of that I would be happy to help. Depending on the type of flap used you may be able to readvance the flap and fix the problem. You should speak with your original surgeon first.